The Merchant collects and processes personal data in compliance with the requirements of the Personal Data Protection Act. We want to let you know how we use your personal information. The data you fill in the basket is used only to fulfill your order correctly and to serve you better. 1. We use personal data to perform the Customer's order. 1.2. Keeping, maintaining and protecting the "Clients" register, storing personal data of customers in the company "Margarita Branska"
Art.3. The register is kept in electronic form. 3.1. When keeping the record on a technical medium, personal data is entered on a hard disk on an isolated computer. 3.2. The computer is securely accessed by a password for access to personal data, which password is accessible only to the persons processing the personal data. 3.3. Access to the operating system containing files for processing personal data has only the persons processing the personal data through a password to open these files. The protection of electronic data from unauthorized access, corruption, loss or destruction is ensured by maintaining high-tech antivirus programs and periodically backing up the data. Art. 5. The personal data in the "Clients" register shall be collected by placing an order in an online store of the company, by the Client in fulfillment of the General Terms and Conditions. Art.6. In all cases, the persons whose data are subject to processing in the register shall submit the necessary personal data to the controller (official) appointed for processing them - a processor of personal data. Art.7. The client is informed about the need to collect personal data from him / her and the Recipient, as well as the purposes for which the personal data will be used by the official. Art.8. In the event of a need to repair the personal data, the Customer shall provide such information to the official. 9.1. The client has access to the personal data he has filled in by entering his account where he can add new delivery data or make corrections to existing data. Art. 10. Only people authorized to process personal data have the password for accessing files containing personal data. Art.11.Only Managing Director and Accountant of the company have access to the personal data. Art. 12. Information from the Customers registry is not exported outside the building of the administrator. 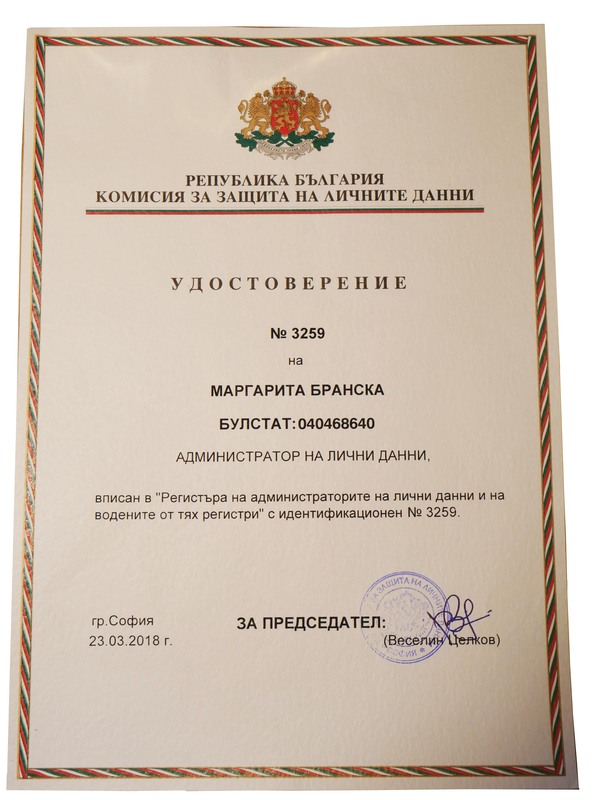 No official or third party has the right to access the "Clients" register of ET Margarita Branska, unless required by the judicial authorities (court, prosecutor's office, investigative bodies). The access of these authorities to the personal data of the persons is lawful. Art. 13. (1) No consent shall be required of the person if the processing of his or her personal data is carried out solely by or under the control of a competent state authority for personal data relating to the commission of offenses, administrative offenses and unauthorized disability. Such persons shall be granted access to the personal data and, where necessary, shall be provided with appropriate working conditions in the premises of the company. (2) The consent of the person shall not be required if the processing of his or her personal data is carried out by the revising public authorities, duly legitimated by relevant documents - written orders of the respective body stating the grounds, the names of the persons, for the purposes of their activity needs to be provided with access to data in the "Clients" register. (3) In case of changes in the company's status (transformation, liquidation, etc. ), requiring the transfer of the personal data registers by the company to another data administrator, the registry shall be transmitted after the permission of the Commission for Personal Data Protection above for submitting the request. Art.15. When introducing a new software for personal data processing, a commission should be set up to test and verify the capabilities of the product in order to meet the requirements of the Personal Data Protection Act and to ensure maximum protection against unauthorized access, loss, damage or destruction. Art. 16. For non-fulfillment of the obligations incumbent on the respective officials under these Regulations and the Personal Data Protection Act, disciplinary sanctions under the Labor Code shall be imposed, and where the non-fulfillment of the respective obligation has been established and established by a competent body, as provided by the Protection Act of personal data administrative penalty - fine. If, as a result of the actions of the respective data-processing officer, damages for a third party have arisen, the latter may be held liable under the general civil law or criminal procedure if the offense is a more serious offense for which criminal liability is provided . Art.17. Archiving of personal data on a technical medium is done periodically every 30 days by the personal data processor in order to keep the information about the persons concerned up to date. PayPal and the Merchant agree to comply with the Personal Data Protection Law. (1)	PayPal and the Merchant have their own, independent privacy policies and privacy practices, and each of them is an independent data administrator (not a joint administrator). (2)	PayPal and the Merchant each have their own, independently determined privacy policies, notices and procedures for the personal data they hold and are each a data controller (and not joint data controllers). (3) In addition to its rights under Section 10.2, when PayPal discovers that there is or is a reasonable probability of a security breach of our Website that may lead to unauthorized disclosure of Customer information, PayPal may take action that are deemed necessary and / or require us to provide them with information relating to such violation. § 3. These Rules are issued on the grounds of Art. 24, para. 4 of the Personal Data Protection Act. § 4. These Rules shall enter into force on 01.06.2017 and after all officials for whom they create subjective rights and obligations become aware of its content against signature. § 5. A copy of the Regulations is available for information and execution.